I have been somewhat distracted lately by mundane activities of daily living and nagging thoughts. The creative juices have been running a little sluggish and maybe the endless winter has been wearing on my nerves. I need spring, a Vancouver spring where cherry blossoms and tulips fill the wet green spaces which we inhabit. When too much clutter starts polluting my brain, I lose sleep and go inwards, even more than my usual introverted self. Why can't I be one of those disgustingly well-adjusted people who run 10 kilometres to clear their heads? My solution is to bake something with lots of butter in it. Not being a bread lover, if I am to enjoy bread, my preference is for something soft and enriched, not crusty and rustic. 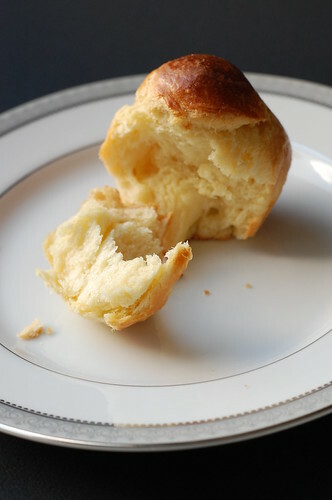 Brioche à tête are rich and tender French breads packed full of butter and egg, in a characteristic shape resembling a little person's head and torso baked in a small fluted tin. Clearing my head of internal clutter might need more than these brioches, but it's a start. Posted by Charmaine at 6:49 p.m. Your brioche looks great! Do you have a recipe to share? March 9, 2009 at 11:28 p.m.
Gorgeous photo of your brioche! I was feeling the same last week and also made brioche (with pastry cream and chocolate chips). There is truly nothing better than all those eggs and all of that butter combined into one. March 10, 2009 at 9:58 a.m.
March 13, 2009 at 9:24 a.m. I'm in awe. Gorgeous photos, I wish there was smell-O-vision/screen available. I agree with Tasty Table. Do you have a recipe to share? March 13, 2009 at 6:31 p.m.